Most Indian cities have one thing in common—a rich heritage. And what better way to discover it than to check it out on foot? The Fort area in Mumbai was constructed in 1716 and housed many residential and commercial buildings apart from three gates—Apollo, Church and Bazaar—and a moat, which stretched towards the west (The Esplanade). Today, there is little trace of this grandeur, though parts of the Fort and Colaba still amaze visitors. A walk here should take you through a treasure trove of architecture and little holes-in-thewall (or pavement) shops that sell a host of curios, books, and cheap Made-in-China electronics. Further down, the Western Railway headquarters and the Oval Maidan are reminiscent of old Bombay. The Art Deco buildings remain intact along with their Gothic and colonial contemporaries all the way through the cobbled street and art galleries of Kala Ghoda, the Prince of Wales Museum and through Colaba. Suffice to say, the walk will keep you engrossed right till the very end. And if humid Mumbai makes you thirsty at the end of the walk, drop into Café Mondegar or any of the other pubs dotting the Colaba Causeway for a great meal over a drink or three. The city boasts some of the best examples of 18th and 19th century British architecture along with what remains of ‘Old Calcutta’ and its zamindari legacy. There are better-known walks, but the one we recommend will take you through the serpentine lanes of old Kolkata. The North Calcutta Walking Tour goes through meandering lanes and courtyards of various noble houses. This tour also includes a visit to the house of Rabindranath Tagore at Jorasanko and the majestic Marble Palace before ending with a trip to the historic Coffee House. If this is too short, try the quaint little walk next door—a journey from Bow Barracks to Burra Bazar, where you will still see vestiges of early 20th century Kolkata. Check out why Chinese breakfast still rules Tiretta Bazar, where the Parsis still live, and how the Armenians gave the city its oldest surviving Christian church. Pass the Bow Barracks—home to some of the oldest Anglo-Indian families in India before settling down for a cup of tea at Burra Bazar—home to the powerful and rich Marwari community, which is still one of the biggest business hubs of the city. Delhi (or, to use the more popular if inaccurate name, Old Delhi) is famous for its distinctly medieval ambience: majestic monuments, street vendors and bazaars with people hawking kebabs and other delicacies. What is called “Old Delhi” today was the Mughal city of Shahjahanabad, built by Emperor Shah Jahan when he shifted his imperial capital from Agra to Delhi. The area was enclosed by a wall with 14 gates. Of these only three—Delhi, Turkman and Ajmeri Gate—survive. 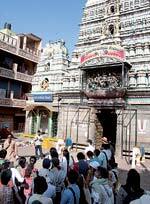 The walk starts from Shri Digambara Jain Lal Mandir and ends at the north gate of Jama Masjid. You go through the Gauri Shankar Temple, the Central Baptist Church, the Sis Ganj Gurudwara (the site of the martyrdom of the ninth Guru of the Sikhs, Guru Teg Bahadur) and the Jama Masjid—a true confluence of religion and history. In an attempt to rediscover the old charm of Bangalore, The Goethe Institute at Max Mueller Bhavan has begun a series of inner city heritage walks into the old city areas, covering Gavipuram (literally cave town) in the heart of old Bangalore, then exploring Whitefield, Bangalore’s IT nerve centre today and finally covering a broad swathe of the city. The walk covers the town, fort, water bodies and gardens of old Bangalore and gives walkers (both long-time residents and newcomers) a nostalgic look back in time. Some places such as Tipu’s Palace charge entrance fees—Rs 10 for Indians and Rs 100 for foreigners. In the sweltering heat of the Hyderabad summer, with temperatures touching 40 degrees and beyond, you might not want to venture out... But wait a fortnight for the monsoons and try one of Hyderabad’s many walks down history. What is likely to interest many is a heritage walk to the famous Charminar. For this, one can opt for a roughly 2 km walk and catch a glimpse of the region's history and heritage. One can begin from the old Municipal office (the local governance during the Nizam era is represented by this building). From here, walk to the Azha-Khana-e-Zehra. Stop here a while for a cup of tea or juice before visiting Dar-Ush-Shifa, one of the oldest secular buildings (completed in 1595). Next to it is the Purani Haveli Palace on the Itebar Chowk Road. One could then go through the Mir Alam Mandi wholesale bazaar and vegetable market into Patthargatti, the bazaar street leading to the Charminar—the monument that has come to represent Hyderabad.